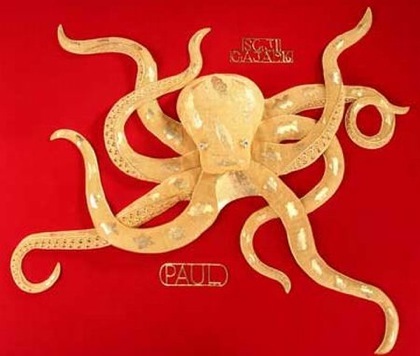 An Indian jewellery company has taken the inspiration from Paul (the psychic octopus) to creating a 22-carat gold accessory to the cephalopod. Paul dominated headlines during this year's World Cup when he correctly predicted the outcome of seven games on the trot, and now Kolkata based Shree Ganesh Jewellery has made a pure gold version of the animal, they presented at the India International Jewellery Show. It is weighing about 3.3kg, and took 30 craftsmen to produce, it is value at INR5,000,000 (US$171,650). Paul now lives at the Sea Life aquarium in Oberhausen, Germany.